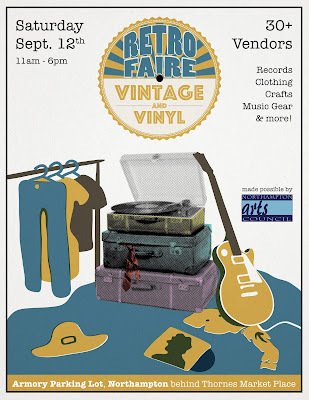 The Northampton Arts Council invites you to RETROFAIRE 2015 on Saturday, September 12. The event takes place in conjunction with Northampton Jazzfest in the space behind Thorne’s Marketplace. RETROFAIRE is an open-air market featuring a treasure trove of 30 vendors selling vinyl records, vintage clothing, jewelry, and other items of interest. Come check out collections from local and regional vendors selling the finest vintage fashions, the freshest records and unique reclaimed & re-purposed designs. Our vendors of interesting, hard-to-find, curious items include Mystery Train Records, Tiny Anvil, Vintage Steele, Wood & Barrel Co., Bucktooth Whale, Blue Collar Artisans, Plumb Farm Workshops, and Estes Millinery. Join us for a relaxed day in the late summer sun, peruse the market stalls, hear the sounds of jazz float through the air and kick back for a glass of wine. The event will also feature a Raffle for a Fender Vaporizer Guitar Amp. Featuring a bow-tie grille and bright retro colors, this vintage-style amp includes two inputs, reverb effects and an overdrive footswitch. $10 Tickets are available in advance at Downtown Sounds or the day-of at the Northampton Arts Council Tent. The drawing will be held at 4:30 PM on the Northampton Jazz Fest Main Stage. You must be present to win. Only 200 tickets will be sold so your chances are strong! All proceeds benefit the Northampton Arts Council’s BJ Goodwin Grant, a grant designed to provide direct assistance to a Northampton-based artist, writer or arts organization in recognition of exceptional work and to support the further development of artistic talents.